Porta-Potty is now monster-free!, originally uploaded by ashpungsnotded. 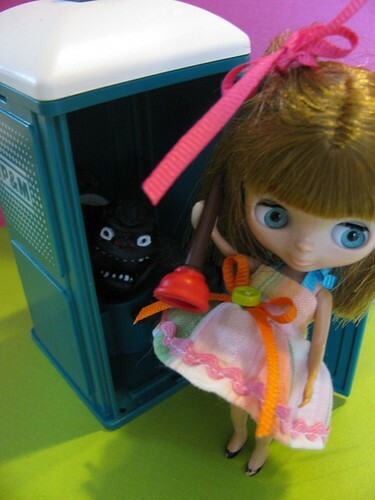 Porta-Potty Monster!, originally uploaded by ashpungsnotded. I have decided that Mondays will be Blythe Doll Day on this website. I have loved dollies my whole life, since I can remember. Discovering Blythe dolls has brought so much joy to my life. They are fun to sew for and even more fun to photograph! If you are a Blythe doll mommy yourself, do not forget to leave a comment. I will draw one name a week and mail you a free petite blythe doll dress! 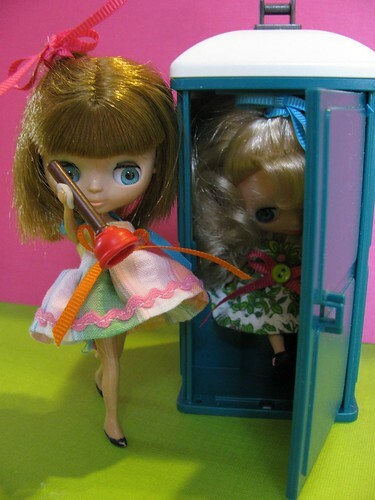 Since the Dollies all have new dresses a camping trip was definitely in order. Ms. Muffet, hanging on the roof, with her spider friend. In Dollyland, camping always involves Cheese, Crackers and WINE! Someone back there has had enough wine. All three wearing their new dresses.